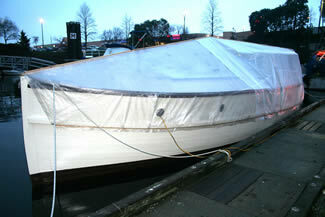 One of the difficulties with keeping boats over the winter is moisture building up causing all sorts of problems. Most of all, this moisture in warm air settles and condenses onto cold surfaces like windows, porcelain, and metal around sinks, fastenings and through hulls. This fresh water can affect electrical, finishes, adhesives, can allow mold and other microorganisms to start and smell, and is one of the components in allowing rot to develop in wood. This is a list of principles that can help in understanding what is happening in a closed boat that is left for most of the winter. Warm air holds water, cold air does not. 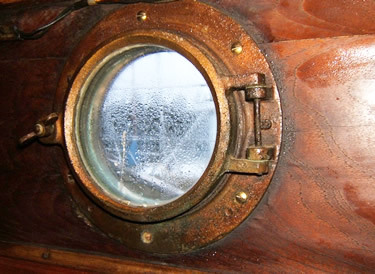 Non-heated boat interior with open vents and windows will help keep an ambient moisture level somewhat equal with the exterior; this stops water from building in the air, in turn condensing on cold surfaces. An alternative is going with a full on heating system running with windows and vents open, so when moisture levels build it can escape through the openings, along with the usually cold surfaces staying warm and stopping water from condensing on them. 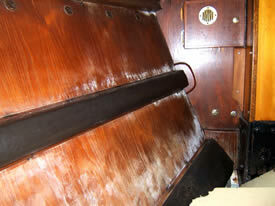 The problem in warm boats is in areas where air is not moving, the air will trap moisture in turn causing problems. Also one of the main issues is the danger and cost of constantly running a heating system. Air movement is very important inside a boat, whether the boat is heated or not. Solar powered vents are a great low maintenance way to have constant air circulation. Cover over port holes or other openings with screen so animals can’t get in. Also try to minimize rain water from directly coming in those same openings. Open all areas that are typically closed, lockers, drawers, engine room, etc. allowing air to move freely throughout. Dehumidifiers work great in the cold but better in a warm boat. There are two basic types; an electric dehumidifier that needs constant power and some maintenance. Or a chemical desiccant that then collects the water in a tray, the chemical dissipates when the water is collected through it and needs to be replaced on a regular basis, also this water needs to be disposed of carefully as it can stain and is corrosive. If you’re not using the boat, you need to take out all objects that can hold water like all fabric, cushions, books, toilet paper, rugs and clothing. Also in all areas like the galley, head and eating tables wipe down with a mild bleach to clean of any thing that can act as a petri dish. 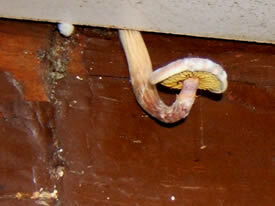 This helps keep mold and other bacteria from having a place to grow. Salt from the ocean spray that is then carried inside the boat can hold more water than normal, so all things that can be washed or wiped down will help minimize excessive moisture levels. If the boat has a full cover over it, these covers must have open ends or vents to also allow air to move freely and moisture to escape. Heat is needed if the boat has things that can be harmed by freezing, like water tanks and hoses, batteries, etc. Heating systems – A light bulb can be used as a heat source but is counter effective in a closed space without having air movement. Electric just heats the air and it is a good idea to have a heater that has a fan built in. Diesel or fuel oil heaters usually vent outside and usually give off a permanent fuel smell in the boat plus there is the danger of an open flame. Propane heaters give off high moisture in their burned exhaust and also have the danger of an open flame. Wood stoves can only be maintained with someone in attendance, and are considered to be a dry heat because they are great for pulling moisture out of the air and venting it with the exhaust.